A great growth and calving ease numbers. WCR Sir Thunder 417 P is born from a first calf heifer, Birth weight of 84 lbs, ratio 109, a great weaning weight of 761 lbs, ratio 111, no. in group of 150, a great yearling weight 1379 lbs, ratio 112, no. in group 146. He not only had a great weaning weight but continued to gain well in the feed lot. 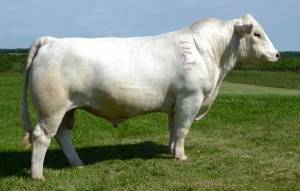 This is a tremendous young bull with an eye appeal and a great disposition. He is a long sided, structurally correct, and still carries the kind of muscle expression we are all looking for. He will make a great outcross for the breeders and put dollars in the pockets of those selling by the pound!